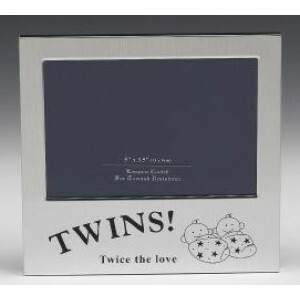 A very cute photo frame in brushed silver coloured metal. 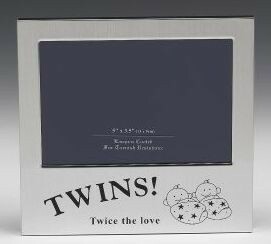 Laquer coated and tarnish resistant photo frames with 'Twins! Twice the Love' message and twin motif. Ideal for newborn gift. Measurements of frame are 14cm wide x 13cm high. Takes picture size 5" x 3.5" (13cm x 9cm).